What is the best chew toy for your dog? One of my favorite responses and most important things I’ve learned from all the amazing behaviorists and trainers I know, about picking the right chew toy, trainer, and harness is - it depends! It depends on so many factors and seems confusing with all the choices out there. That is why our Busy Buddy® Line has a variety of chew toys. 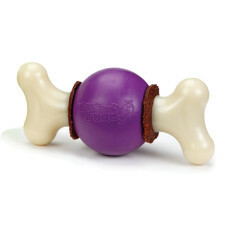 It provides many choices so you can find the right toys for your chew hound! I’d like to try to help you out with this one since I know a little about dog toys. Let’s start by figuring out what we know about your dog. Puppies should be introduced to toys as early as possible, but they don’t even have teeth until three to six weeks of age. So puppies need softer toys to protect gums and baby teeth. Consider dog safe plush toys and puppy lines like Premier’s Busy Buddy Puppy or Pogo Plush at this stage. Dogs develop their adult teeth around six to seven months, having started to lose baby teeth around four months. This teething period can be difficult and you will want to have lots of appropriate chew toys on hand to avoid having your puppy chew up your favorite shoes. Safe chew toys can help keep a dog’s teeth healthy throughout their lifetime. Even so older dogs can develop issues with their teeth and gums just like us humans, due to tooth decay and wear and tear. These dogs often still enjoy chomping on a good chew toy but may need a softer chew like our Busy Buddy Senior line. Generally, the larger the dog, the larger the toy. Consider too the type of muzzle your dog has. For example, Greyhounds and Labradors can fall into the same weight range but a greyhound’s muzzle is much slighter than the thick muzzle of a Labrador. My rule is if you just aren’t sure which size will be safe for your dog, go up a size. Some dogs love to get the toy down, hold it between their paws and chew with all their might. Others prefer to toss the toy around, flip it in the air, bounce it down the hall and then settle in for some light mouthing. And of course others do everything in between. How your dog likes to interact with toys will help you decide on whether to purchase the toughest toys on the market or the softer chew your dog may prefer. 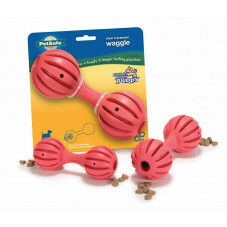 Our line of Busy Buddy toys provides choices for every dog. When purchasing a toy consider everything you know about your dog, read the labels carefully and adhere to safety recommendations. Follow the guidelines on the packaging about weight, breed and chew strength to choose the best one for your pup. Read any accompanying instructions and save the package for a while in case you need to call the company with questions. After you know what your dog may like, here are some tips on what to look for in a good chew toy. I prefer a natural rubber chew toy for most dogs. Not all rubber is the same however, so some hold up better than others to chewing. The thickness of the rubber matters as well. Nylon can be a good choice for some dogs and is very durable especially for those dogs who destroy every toy. No dog toy is indestructible! If they were truly indestructible they would probably be way too hard and could damage a dog’s teeth. A toy may be extremely durable, but always supervise your dog with the toy to determine how it holds up to your dog. If the toy becomes damaged replace it with a new toy. I know we want these toys to last forever but dog’s teeth are designed to rip, tear and crush. The best you can do is provide appropriate things for this fun activity and replace them when necessary! Pet professionals are always testing out new chew toys. So ask your veterinarian, veterinary technician, trainer or Premier professionals. Also, ask the employees in your local pet retail store what their experiences have been with different chew toys. We are all here to help! I love food/treat dispensing chew toys and highly recommend them. Why, do you ask? They encourage dogs to interact with the toy, they keep dogs busy and appropriately engaged for extended playtime, they can be used to feed the dog’s regular daily portion of food instead of high calorie treats and keep dogs from scarfing their food from a bowl in less than 5 seconds. Which chew toy is your dog’s favorite?